Omega's systematic reissuing of the Vanguard and Everest catalogues shows great care and attention to detail. Technical and artistic details are well handled although I wish that precise session dates were given. They do not flinch from helpful consumer information such as the total playing time of their discs which in this case is shorter than you might have hoped. This is not however a premium price disc so you can easily make allowances. The collection has classic status and is one which apart from the Adagio (a short filler) will be recognised from the LP era (VSD2083). Golschmann (1893-1972) directs a luxuriantly expansive anthology of the shorter works. Essay No. 2 is broad and warm - epic in feel and symphonic in approach. Its parallels are to be found in Bax (Northern Ballads 1 and 2) and Sibelius but typically superheated and tormented. The Shelley Scene is a febrile dream rising to a lovingly coaxed climax influenced by Sibelius and Richard Strauss. It is not far distant from the Essay in style though less tempestuous. A Stopwatch is for male voices, percussion and brass and sets Stephen Spender's sorrowing poem for someone killed in the Spanish Civil War. This is determined and angry music which reminded me of the Angel of Death music in Dona Nobis Pacem by Vaughan Williams. A Hand of Bridge to a libretto by Menotti is Barber's true chamber opera - short (less than ten minutes) and economically scored. There are only four singers. The plot takes its tension from the deadly routine of a nightly game of bridge and the inner thoughts of the four players. The wordplay and musical setting is irresistible - this should not be missed by any admirers of Sondheim's music theatre. The Serenade is an early and pleasant but unmemorable work in which I hear more of the central European models of Reger and Schmidt than anything terribly distinctive or memorable. The Adagio (not Golschmann but Antonio Janigro and the Solisti di Zagreb recorded in 1962) is suitably broad. Comparisons are not directly available at least not as a single identical collection. In some ways it is difficult to place this collection. 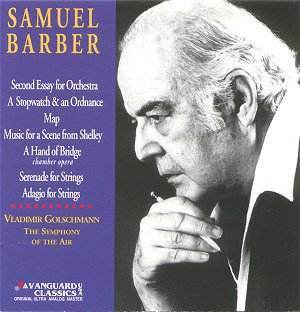 It is not Barber's 'greatest hits' apart from the Adagio. The Essay and Shelley Scene are big Barber, bruisingly romantic, A Stopwatch is spare and serious, A Hand of Bridge is a brilliant psychological play while the Serenade is good to have but is unlikely to draw you back again. The collection is valuable as a challenging and intrinsically satisfying sampler. If you warm to the first two tracks go on to the other two essays and the symphonies. Abravanel is very good in this music - crackling with energy tempered with a tender way with the great melodies. Antar is a neglected prize among Rimsky's works ranking with Sheherazade. The orchestra is brilliant, hoarse and visceral in the brass, flighty and impetuous wind section (the brilliance of flute clearly inspired Glazunov in his ballet The Seasons) and only among the strings which could have benefited from a shade more warmth and tonal allure are there the slightest reservations. The ideal is to be found in BMG-Melodiya's twofer of the three Rimsky symphonies with Sheherazade. The Caucasian Sketches is a popular work of which enigmatically there are few recordings. The Caucasian Sketches have These You Have Loved status because of its last movement Procession of the Sardar but the big first movement In The Mountain Pass is wistful, In the Village exotically rhapsodic from sinuous (recalling the tar and duduk of Georgia) to a quicker and irresistible dance tempo, In the Mosque rather nondescript but in the Procession is established the idiom for a thousand Hollywood triumphal and barbarous marches. From such quarries did Jarre mine the music for Lawrence of Arabia and Rozsa for El Cid. The Gliere is a fun piece that stamps emphatically and in its opening measures is clearly influenced by Mussorgsky's Pictures from an Exhibition. This is somewhat outside my usual field. I was tempted into this material by Davrath's lissom voice. She is of course the singer the prime and unmissable collection of Canteloube songs (available in a two disc set from Vanguard). Her voice is tender, strong, nasal, arch, shy, abandoned, free from vibrato, pure and clean and distinctly un-operatic. She has that platinum quality of voice that is unsophisticated and girlishly innocent. Going by track record this is not something that can be taught. You either have it or you don't. Davrath's facility in eight languages undoubtedly aids her interpretations which are always intelligent and which do not give the impression of being phonetically acquired. There are 13 Russian songs, 15 Yiddish and 14 Israeli. The origins tie in with the singer's life travels: born in Ukraine, moved to Caucasus, the to Israel. There is too much territory to cover so let me single out The Birch Tree (the theme used in Tchaikovsky 4), Moscow Nights (Dr Zhivago), Chassidic Melody with its catchy refrain, Es Brent, a lament for scorched earth, touching in Reizele and Viglied. Robert deCormier is the conductor and arranger of the Russian and Yiddish folksongs. There are various arrangers for the Israeli songs and a single conductor Josef Leo Gruber. Some of the arrangements are less than sensitive but then again you encounter poetic and far from obvious treatment as in the Hinach Yafa as prepared by Y Admon. The smile in Davrath's voice is in heart-warming evidence in Ad Shefayu'ach Yom. The Russian songs are arranged with accordion and balalaika to the fore. The Yiddish songs make fuller use of the orchestra which as in the case of the peerless Canteloube set remains anonymous - presumably a pick-up band. Perhaps someone can throw some light on the musicians involved in the NYC and Vienna sessions? The tracks were recorded between Nov 1959 and May 1962 in New York City and Vienna. Davrath is intimately balanced as against the instrumentalists. Her voice can stand this very easily.